I was looking at my project and realised that I haven't done a flower-picture in a long time! So... 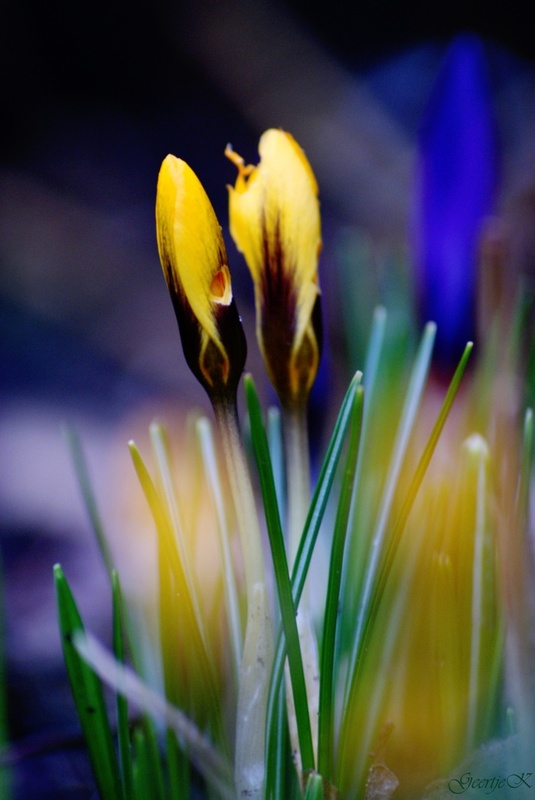 I ran into the garden and found some Crocuses at the verge of flowering. Although, at closer look it seems like I wasn't the first to find them. But yes, Spring is here! Thank you for looking, commenting and faving! I spotted my bike on the PP, so great to discover that. Hope you all have a wonderful weekend! Breath taking mix of color and light! Gorgeous! It looks like someone thought they'd make a tasty meal. Love those bright colors! Lovely shot!Spring is just around the corner! Beautiful!!! Love the different colors!!! This is so pretty! I'd love to see it on the front of a card or on a calendar! Really lovely - great colors and focus. Lovely image with great lighting and colors. Beautiful colors and great POV. Beautiful color in this. The spring bulbs are poking their heads up here as well. wat een prachtige kleuren! heb zin in de lente! I love the quote you used :) I'm a quote-addict :) Beautiful colors and focus! so beautiful, love the colours. This is such a beautiful shot. The colors are amazing. Fav!